A young visitor releases lady bugs at the ribbon-cutting celebration for the LSU AgCenter Children’s Garden. Photo by Lauren C Brown. 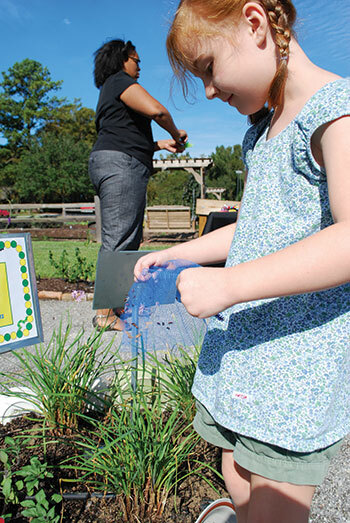 With butterflies, edible plants and the scent of citrus and flowers, the new LSU AgCenter Children’s Garden is an outdoor utopia for budding gardeners. Children are encouraged to touch, feel, smell and even taste in the garden. Jane Paccamonti, who is curator of the LSU AgCenter’s Windrush Gardens, designed the grounds. Located at the Burden Center, the garden is invaluable for teachers interested in starting class gardens and families who want to grow their own food. Activity-filled backpacks offer children opportunities to learn math and science skills while they explore. The garden fulfills the botanic mission of the AgCenter’s master plan by establishing a destination for the public. “There’s so many entities implementing children’s, school and community gardens, but there’s a lack of information on how to sustain the gardens,” said Burden Center Resident Director Jeff Kuehny, PhD. Recently, the Blue Cross Blue Shield of Louisiana Foundation partnered with the Burden Center to help expand the educational aspect of its programming and promote a healthy lifestyle that includes fresh produce and being outside. Fontenot is currently working to establish year-round programs focused on educating teachers and community gardeners about how to maintain and sustain gardens similar to the new one at the Burden Center.